Your hosts Scot Bertram (@ScotBertram) and Jeff Blehar (@EsotericCD) with guest Jay Cost, author ofÂ A Republic No More: Big Government and the Rise of American Corruption,Â contributing editor atÂ The Weekly Standard,Â and yinzer. Follow Jay on Twitter atÂ @JayCostTWS, readÂ his work here, andÂ buy his book on Amazon here. How did Jay get into them? Jay talks about discovering the Kinks in college, once he finally got enough disposable income to hunt down their CDs. Theyâ€™ve never left his life since, an endless well to dive back into and discover new things. Jeff talks about his experience in high school as a â€˜classic rock kidâ€™ who avoided the Kinks because nobody ever talked about their classic-era records. A chance purchase ofÂ The Kink KroniklesÂ led to a follow-up used CD version ofÂ Village Green Preservation SocietyÂ and after that all bets were off. Jeff recalls being thrown for a loop by Ray Daviesâ€™ social and lyrical concerns, which were as un-â€™rockâ€™ as anything he had ever heard up until that point. The gang surveys the early (1964-1965) era of The Kinks, when their albums were mostly-appalling collections of half-competent covers and lame â€˜originalsâ€™, while their non-album singles were one titanic landmark of early British Invasion rock (and proto-punk) after another. Nobody has much other than laughter forÂ KinksÂ andÂ Kinda KinksÂ outside of the mega-hit singles found on each, though Jeff offers praise to â€œSomething Better Beginning,â€ the conclusion ofÂ Kinda Kinks. But those amazing singles! â€œYou Really Got Me,â€ â€œAll Day And All Of The Night,â€ â€œTired Of Waiting For You,â€ â€œSet Me Free,â€ â€œSee My Friends,â€ â€œI Need You,â€ and the list goes on and on. Before the Kinks became the textbook example of an â€œalbum act,â€ they were one of the truly legendary singles acts in UK history. 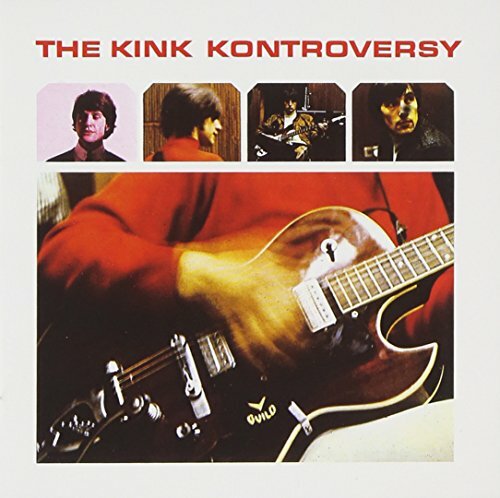 The gang spares more of an ear for the Kinksâ€™ third record, the transitionalÂ Kink Kontroversy. The originals still arenâ€™t very sophisticated, outside of the single/B-side and a track or two, but theyâ€™re getting more refined and â€œMilk-Cow Bluesâ€ is maybe the only great cover the Kinks ever recorded. Also,Â The Kink KontroversyÂ sports one of the coolest, sleekest album covers of the entire pre-psychedelia pop era.Â Check it out here. The halting flirtation with psychedelic touches found onÂ Face To FaceÂ are abandoned completely after this point, yet the Kinks keep rising from artistic triumph to triumph even as their commercial fortunes decline. First with â€œDead End Street,â€ a brilliantly catchy pop single written about the horrors of living in a tenement slum, and then withÂ Something Else By The Kinks, home to twelve deft character sketches of life in mid-sixties Britain. Jay thinks thatÂ Face To FaceÂ marks Rayâ€™s initial lamentation of the costs of modern â€˜progressâ€™ for the simple dreams of ordinary folks, but doesnâ€™t proffer a solution: the solution, at least as Ray sees it, is put forth onÂ Something ElseÂ andÂ Village Green Preservation Society. Jeff thinks â€œDeath Of A Clownâ€ and â€œSituation Vacantâ€ areÂ Something Elseâ€™s best songs, but of course Scot and Jay point to â€œWaterloo Sunset,â€ often hailed by other musicians as the most beautiful pop song ever written in the English language. Scot marvels that a song so highly rated by Daviesâ€™ peers (and by critics) is actually relatively obscure in terms of radio airplay. The Kinksâ€™ US performance ban (and its effect on Ray Daviesâ€™ delve into a highly British songwriting obsession) is discussed, and the primitive production stylings of Shel Talmy are lamented. The Kinks reach the full flower of their maturity, join the Sherlock Holmes English-Speaking Vernacular, and observe the Decline and Fall of the British Empire.Â Itâ€™s not a unanimous decision for the #1 spot (Jay still prefersÂ Muswell Hillbillies), but everyone agrees thatÂ The Kinks Are The Village Green Preservation SocietyÂ is one of the most magnificent achievements not only in The Kinksâ€™ discography, but in pop music history. Ray Davies finally dedicates himself to an actual concept album, built around the cultural and social concerns on display over 1966-1967, and the result is flooring. Unless youâ€™re a Kinks fan, you might not have even heardÂ one single songÂ on this record, and yet nearly all of them are masterpieces. Jeff talks about how â€œDo You Remember Walterâ€ is the most devastatingly realistic requiem to childhood dreams ever writtenâ€¦and yet it ends with a hopeful conclusion. He also cites to â€œPicture Book,â€ â€œMonicaâ€ (a joyful song about the local town prostitute!) and especially â€œPeople Take Pictures Of Each Other,â€ which even to this day explains â€™selfie culture.â€™ Jay praisesÂ Village Green as the record where Ray Davies actually provided a constructive answer to his critique of society advanced onÂ Face To Face andÂ Something Else,Â even asÂ VGPSÂ is essentially a lament for a world slowly being destroyed by modern capitalist commercialism. Critics and fans sometimes like to dismiss theÂ LolaÂ album as a step down fromÂ Arthur â€“Â just â€œRay Davies bellyaching â€˜PAY MEEEE!! !â€™â€ (as Jay puts it). The gang is having none of it. All three of them thinkÂ Lola Versus Powerman And The MoneygoroundÂ (1970) is a superb record, one of the Kinksâ€™ finest, and Jeff and Jay consider it superior toÂ Arthur. Scot calls out to Daveâ€™s magnificent â€œStrangersâ€ and has no idea why classic rock radio programmers arenâ€™t playing â€œPowermanâ€ on heavy rotation. Jay considers the record to be a morality tale about being â€œseduced by the serpent,â€ the serpent in this case being the music industry and its promise of fame, fortune, and self-fulfillment. To Jay, â€œLolaâ€ isnâ€™t just a goofy novelty song about a transvestite, itâ€™s a song about an outsider liberated from shackles and illusions, someone whoâ€™s justÂ got to be free. Jeff agrees with Jay aboutÂ Lolaâ€™s fundamental unhappiness, and finds it best expressed in the forgotten (except by Wes Anderson) album track â€œThis TimeÂ Tomorrow,â€ where the loneliness of a touring musician is treated without bathos or self-pity. Scot refers toÂ Everybodyâ€™s In Show-Biz, as â€œthe drunkest album ever recordedâ€ and heâ€™s got a point. Itâ€™s not a cliff-dive afterÂ Muswell Hillbillies, but it is a noticeable drop-off as Rayâ€™s songwriting shifts to conceptual concerns and begins to consciously retread ground already covered before. Neither Scot nor Jeff (especially Jeff!) is a fan of this era â€” Scot names â€œJack The Idiot Dunceâ€ as his least favorite Kinks song of all time â€” but Jay makes a bold defense of them, and recommends the live shows from this era. To be fair, the individual songs he singles out areâ€¦actually pretty darn good. The Kinksâ€™ late â€™70s/early â€™80s commercial revival:Â Sleepwalker, Misfits,Â Low Budget, andÂ Give The People What They Want. New label + internal band rebellion = Ray returns to a more commercial soundâ€¦or at least a series of records that arenâ€™t dependent upon arch theatrical conceits. The gang really enjoyÂ SleepwalkerÂ andÂ MisfitsÂ even though they donâ€™t get any airplay anymore. Ray actually seems happy as a songwriter, for once! Plus a lot of the bandâ€™s radio hits still hold up. Jay thinks ofÂ MisfitsÂ as the â€˜happy endingâ€™ that the Kinks deserved but never quite got. Jeff singles out â€œBlack Messiahâ€ as a fascinatingly troubling song that could never in a million years be written today. Jay, Scot and Jeff each name their 2 key albums and 5 key tracks by The Kinks.